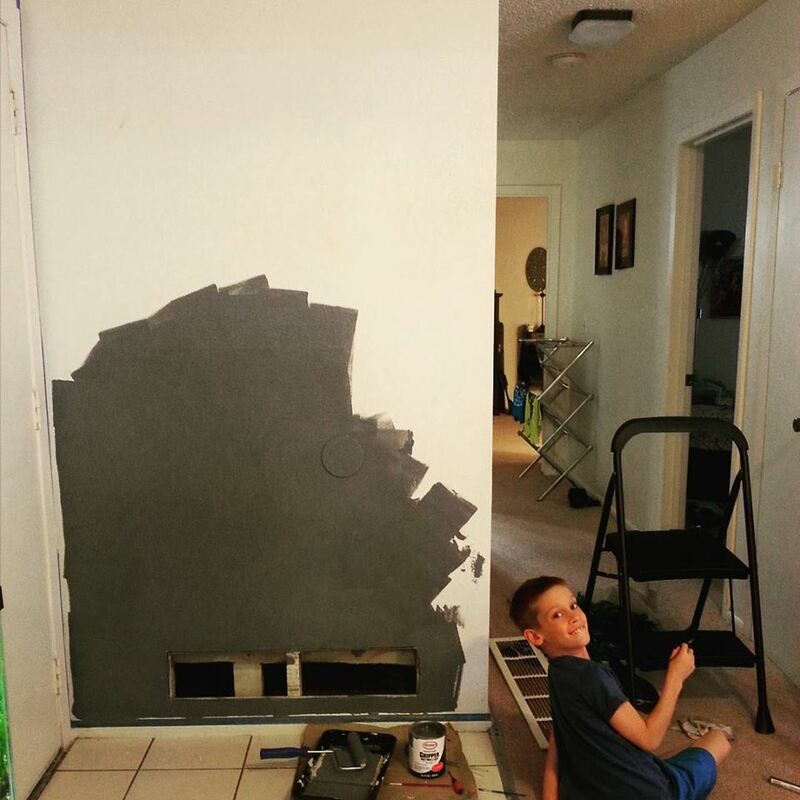 This is something I have always wanted to do, so it was our next home project. I wanted a small space that served as a Command center for my family as well as a place to have fun. I choose a small wall by the entry door and it works perfect for our needs. One of the funnest things about the wall, is we get to decorate it for all the holidays. I like looking up chalkboard decorations on Pinterest for inspiration, plus it lets me practice my lettering. 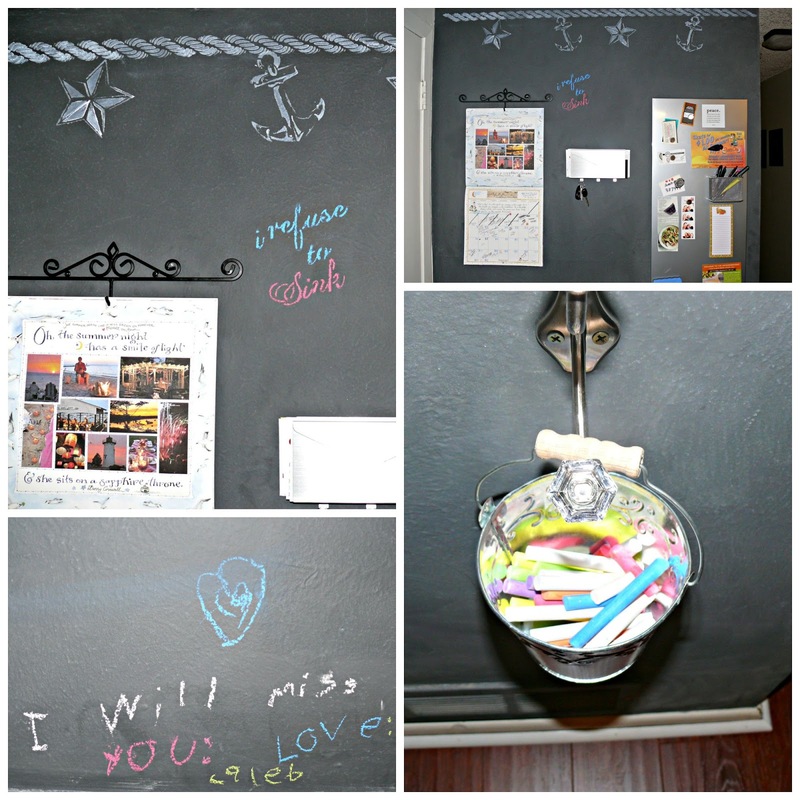 On this wall I also purchased a magnetic board from Ikea to pin all the important papers and cards too, as well as a letter holder with key hooks. Then I added a calendar wall hook and have that hanging there as well, everything I need that helps me keep track all in one space. paint brush roller, I bought a foam one to leave no textures. You want a wall that has little to no textures, if you have textures those will show up every time that you write/draw on your board. I even purchased some fine sand paper and sanded my wall by hand to remove any large textures. Once you have done that, I cleaned my wall with a one part Dawn soap 4 parts water solution to make sure it was a clean slate. Tape off that wall with any joined wall spaces. Once tapped off, I rolled on my first coat of paint. Let that fully dry, I even pointed a fan at the wall for faster dry time. Once that dries, paint a second coat on and let that fully dry for 24 hours. Don't touch it for that long. 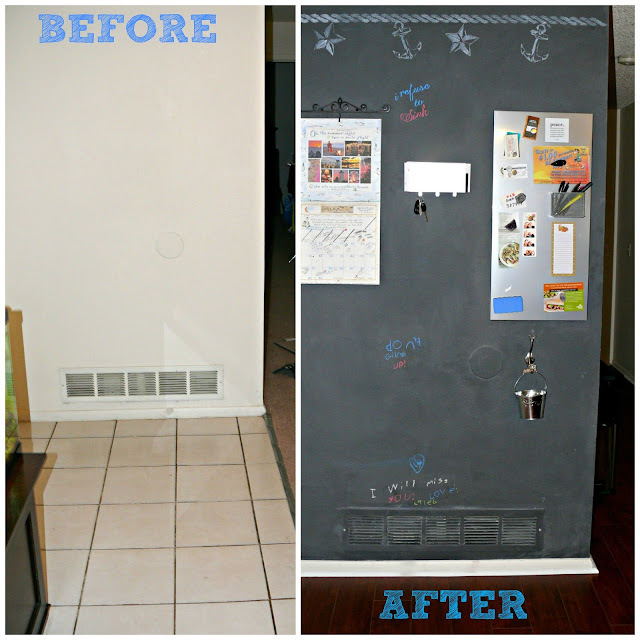 The next day you are ready to "season" the chalkboard, this step is very important as it will help break in the wall and get it ready for drawings/words. If you don't season, you'll draw on it and go to erase and the letters wont come up! So season, it good. 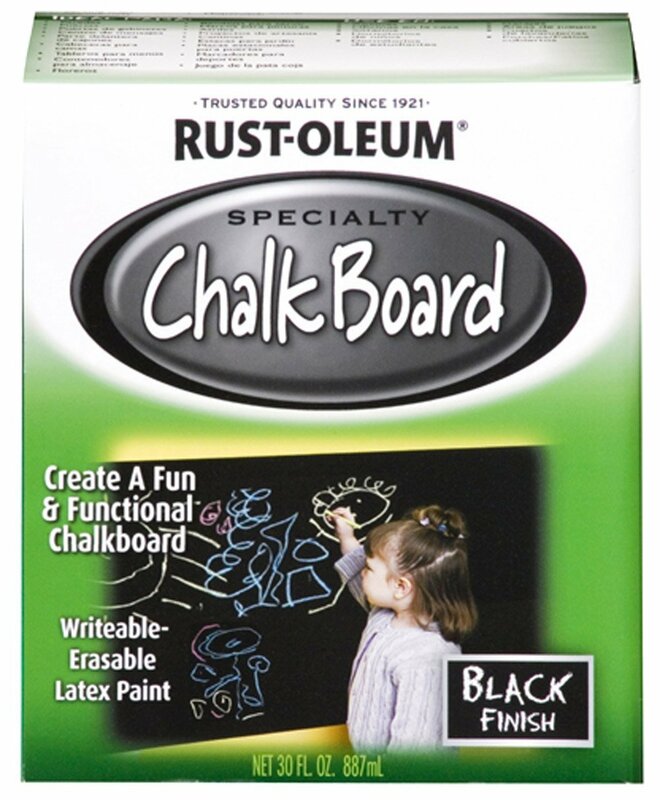 Take your white chalk and hold it long ways and run it up and down all over the board not leaving any blank areas. When your done the entire board should look White. You don't have to apply with a heavy pressure, just be consistent with your strokes. Wait another 24 hours, then wipe it all down. I used circular motions and I found that a microfiber cloth worked better then a eraser. Its my own preference. Then it will be ready for use. I love our wall, we have had it for half a year now and both my son and I equally enjoy doodling on it. Word of caution, it does leave dust at the bottom. It will make a very small mess under, I just sweep it up and it doesn't bother me. We got new wood flooring during the chalkboard process! 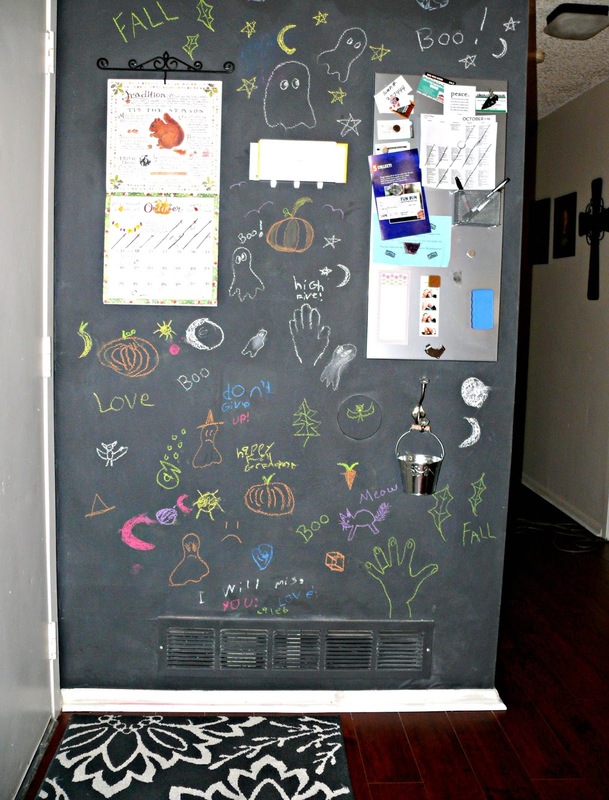 I love your chalkboard wall. We did a small portion of our pantry door and like you, we used Rustoleum, but in green. I wish I could have done this when my kids were young! Great job! Thanks for sharing with the Thursday Blog Hop! My son, who is now 13, would have loved this. He was always writing on the walls. This would have been an ideal solution for him and I. I am also prone to writing phone numbers and addresses on the wall - that way I can't loose them!! Looks lovely - well done! 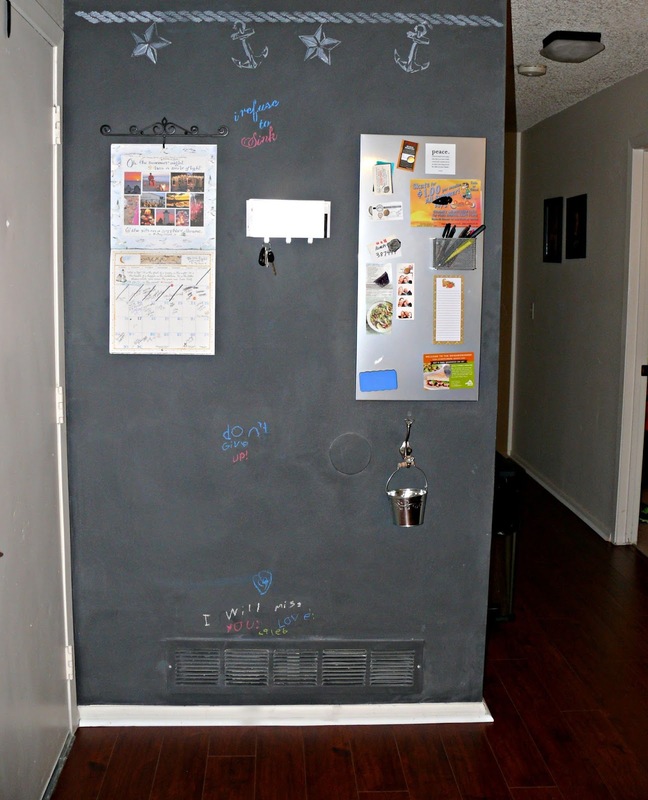 I really want to do this in my kitchen. 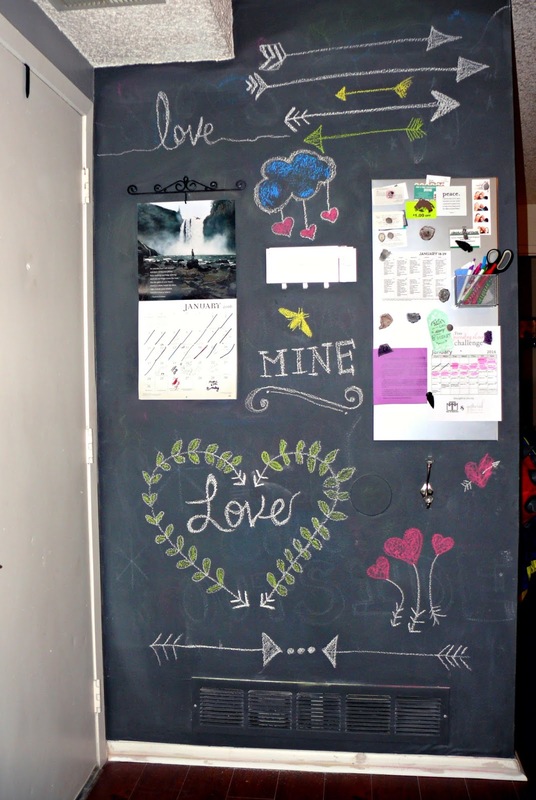 I have a mini chalkboard hanging there now, but I want something bigger. Too bad we rent. 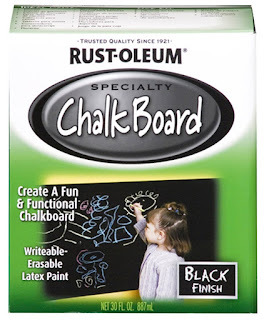 I'm thinking about making a huge chalkboard with this paint and hanging it like a picture instead.